Jazz dance grew from influences of other dance styles such as ballet, hip hop, and contemporary. 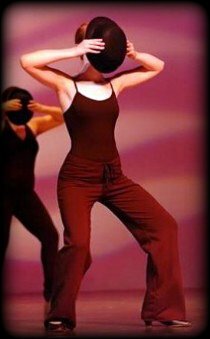 As in most forms of dance, technique is the foundation for all modern jazz dance movement. Students will focus on jazz techniques as well as more contemporary movements. All classes explore a variety of jazz dance and music styles including Lyrical, Broadway, and Traditional. Ladies: black split-sole jazz shoes, black leotard & tights (any color, dance shorts or jazz pants are acceptable), hair back. Men: black split-sole jazz shoes, athletic pants and t-shirt (form fitting), dance belt is suggested. Ladies: black split-sole jazz shoes, leotard & tights (any color, dance shorts or jazz pants are acceptable), hair back. * STUDENTS WILL NOT BE ALLOWED TO DANCE BARE FOOTED OR IN SOCKS.